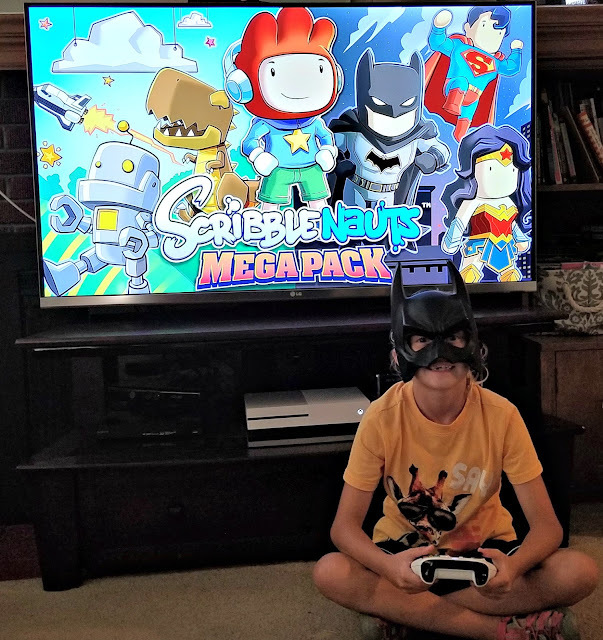 We had some BATMAN DAY fun playing "Scribblenauts Unmasked: A DC Comics Adventure" thanks to Warner Bros. Interactive Entertainment sending us a free copy of the SCRIBBLENAUTS MEGA PACK they are releasing on September 18, 2018. SCRIBBLENAUTS MEGA PACK combines upgraded versions of previously released, "Scribblenauts Unlimited" + "Scribblenauts Unmasked" in one video game bundle which includes new content for both titles. It is available for Nintendo Switch, PlayStation 4, PlayStation 4 Pro and Xbox One gaming consoles. As a parent, I appreciate that Scribblenauts' games focus on players utilizing their creativity and imagination along with vocabulary and spelling skills to solve puzzles and overcome challenges to win the game. Using adjectives to enhance the abilities of characters and objects and nouns to create helpful tools and vehicles are an essential part of these games. Utilizing the games extensive dictionary database, players can conjure up user-created objects or alter the features of characters within the games that range from incredible to wacky. I also like the old school side-scrolling views the game is laid out in while my kids appreciate the open world aspect of the play. They love games that let them explore rather than ones that force you to follow a script so Scribblenaut games are always a hit with my twins. The distinctive Scribblenauts art style with its sketchy tones is an aspect of these games my son and daughter really like. SCRIBBLENAUTS MEGA PACK improves on this aspect by now having the hand-drawn scenery and objects that are a highlight of these two games displayed in high-definition. 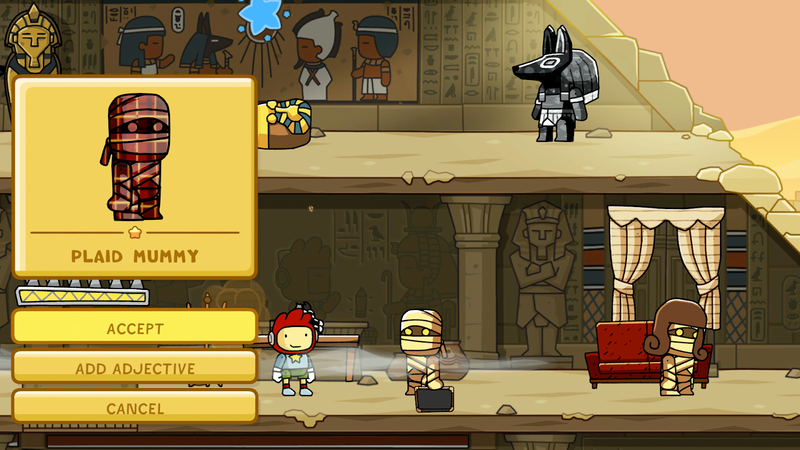 Another nice feature of the MEGA PACK is having added the Scribblenauts "sunflower" text entry system to both games making them much more user friendly than the earlier versions of "Scribblenauts Unlimited" and "Scribblenauts Unmasked." Also both games had the two-player mode upgraded to provide for a more collaborative and interactive experience. It is nice to see my Wonder Twins teaming up as they activate powers and craft things so they can solve the problems the game presents them to overcome. It is great to see them working together and having fun spending time with each other. 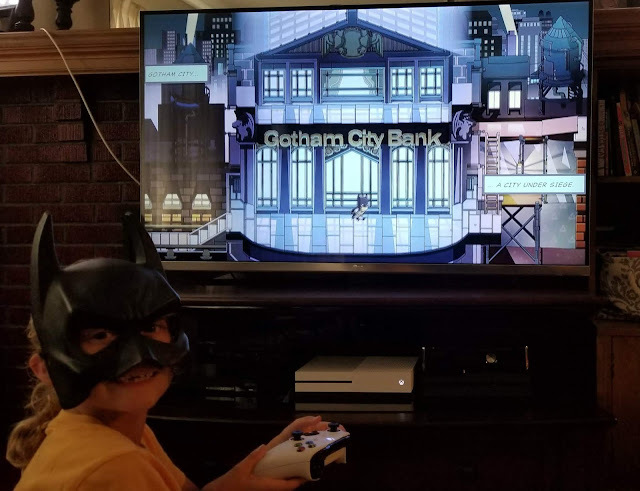 So as I mentioned, it is Batman Day and my kids are having a super time interacting with the Caped Crusader and exploring Gotham City while playing "Scribblenauts Unmasked: A DC Comics Adventure." Wow there is Batman … and he's drawn in the classic Scribblenauts style. Plus the game's dictionary has been expanded to incorporate references from DC Comics so you can create a Batmobile and take it for a spin. You know that was a big hit with the kids! 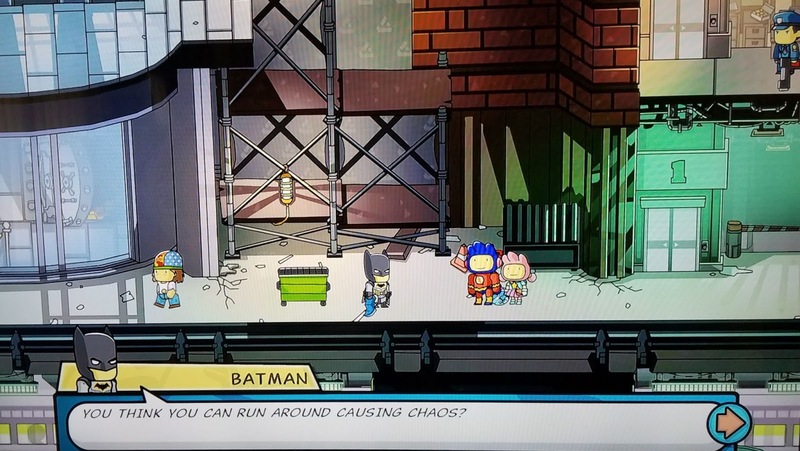 "Scribblenauts Unmasked" isn't just about Batman though, the game incorporates thousands of DC Comics references into it. Ally with a variety of heroes and battle numerous villains while traveling among iconic locations that in addition to Gotham City include Atlantis and Metropolis. It really is an immersive experience into the DC universe that combined with the Scribblenauts style imagery really gives this game some fantastic comic book flair to it. The SCRIBBLENAUTS MEGA PACK also adds two new locations into the Unmasked game. Titans Tower, headquarters of the Teen Titans (did you see their animated movie this summer?) and Belle Reve which is the base of operations for Suicide Squad (have to admit I haven't seen that movie yet myself). The game has also been updated with the addition of hundreds of new DC characters, objects, and costumes for players to interact with. 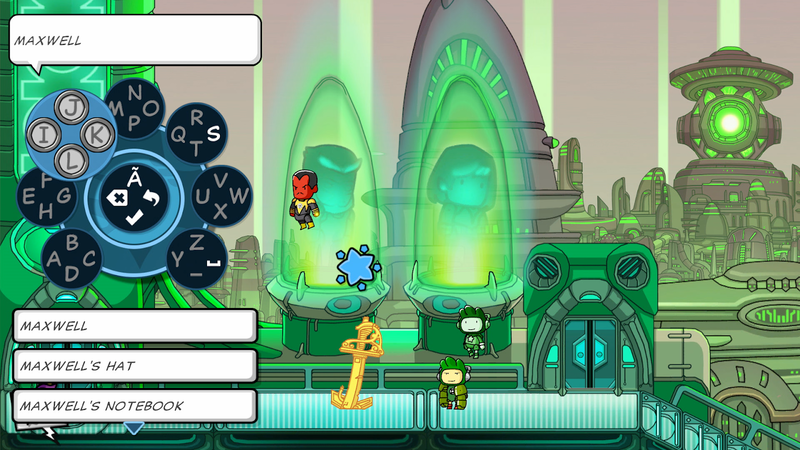 Dress your Scribblenaut to mimic your favorite DC Comics super hero or create your own look. Customizing your character was an aspect of the game my kids truly appreciated. They also really enjoyed being able to summon heroes like Batman and Superman to join them in action to help defeat bad guys like Batman's nemesis the Joker and the Green Lantern's archenemy Sinestro. All the special comic book inspired details of "Scribblenauts Unmasked" put some big Joker sized smiles on my son and daughter's faces while playing the game. It was a great way to enjoy spending Batman Day. Of course my family also spent some time playing the other game included within the MEGA PACK too! 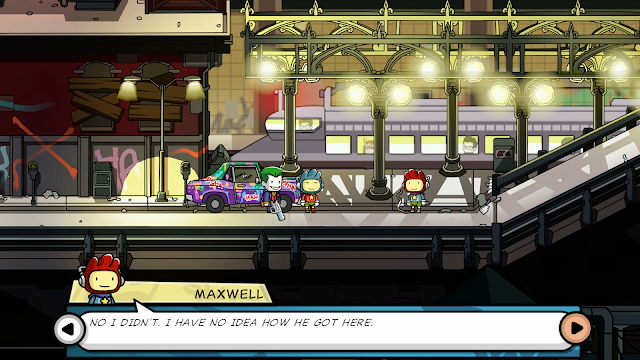 "Scribblenauts Unlimited" is fun in its own right. Players help the game’s hero, Maxwell, solve robust puzzles and challenges by summoning objects as varied as “colossal hoverbus” and “microbial fire tornado” in this Scribblenauts adventure. Explore a variety of places ranging from a mummy's tomb to a pirate ship. "Scribblenauts Unlimited" has been updated with two new bonus levels, The new Zed Zeppelin has players work with crew members to keep the dirigible safe while the new Land of Sweet Hyperbole level allows players to drive around in a sweet ride and interact with candy themed neighbors. When it comes to "Scribblenauts Unlimited" the only limitations are a player's own imagination. SCRIBBLENAUTS MEGA PACK earns A Geek Daddy nod of approval because it is educational and entertaining. Kids are developing their spelling and vocabulary as they play. It is also great for promoting children's creative thinking and imagination as well. Parents have to like that! This is a video game where kids are actually learning while having fun! "Scribblenauts Unlimited" and "Scribblenauts Unmasked: A DC Comics Adventure" are rated E10+ with Cartoon Violence & Comic Mischief. 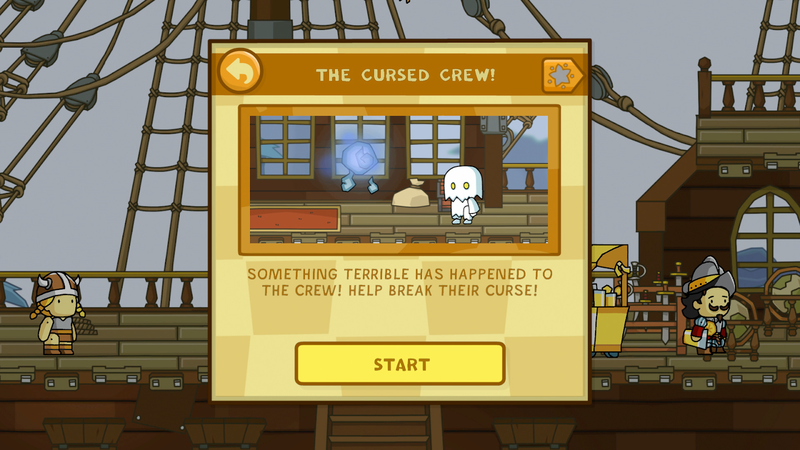 For more information about the SCRIBBLENAUTS MEGA PACK that bundles them together with updated content go to www.scribblenauts.com.